After moving into my first apartment this September, I was overly excited to start all of my domestic DIY projects that I couldn’t do in the dorms—brewing kombucha and beer, canning fruit, baking bread, and growing herbs. I eagerly biked to the Union Square farmer’s market and filled my basket full of baby basil, cilantro, and parsley plants. I brought them home and placed all of my new plants next to my roommate’s sage and rosemary on the windowsill. For the rest of Fall, we had a happy herb garden in our kitchen, using the herbs daily to flavor almost everything. Unfortunately, winter brought shorter hours of sun, and almost no natural light reached our kitchen window in our dingy New York apartment. Sadly, one by one, our plants began to die. But now that spring has sprung, I am excited to start the windowsill herb garden again. This guide will help you grow your own plants in your small, sunless New York apartment for those like myself not blessed with the greenest thumb. 1. Prep the pots. 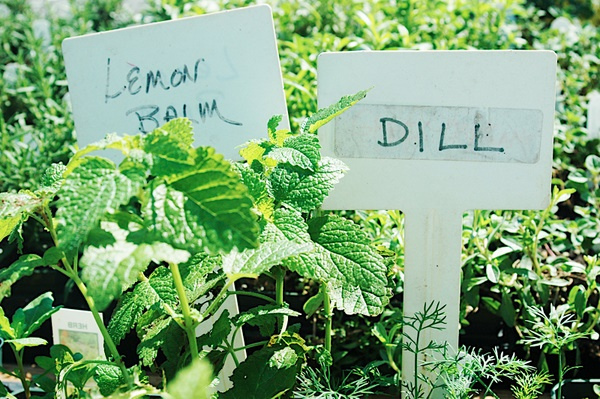 Make sure you take these small steps to have the herbs grow optimally. Herbs require at least five hours of sunlight in a sunny south-facing windowsill a day. Make sure your container is at least six inches deep and has a good draining system. Use potting mix, not soil for indoor plants. Basil, parsley, chives, oregano, sage, mint, or thyme are good herbs to start with. 2. Upkeep. Make sure to water sparingly because herbs do not like dripping wet soil. Trim the plants regularly to encourage growth. 3. Consider other plants. Flowers or flowering herbs are also great options to add some beauty to your herb garden. Consider edible flowers like calendula, nasturtium, savory, or dill. If you are forgetful or overly busy, consider growing cacti or air plants that require less upkeep. 4. Decorate. Consider repurposing old containers to plant the herbs in, or making hanging rope planters so your plants are decorative as well as functional. 5. Use your herbs creatively. Dry supplemental herbs for later use, or use herbs in sachets, teas, or salads for added flavor. A homemade dried herb mix would make a great Mother’s day gift!